Zermatt - variety and charm! 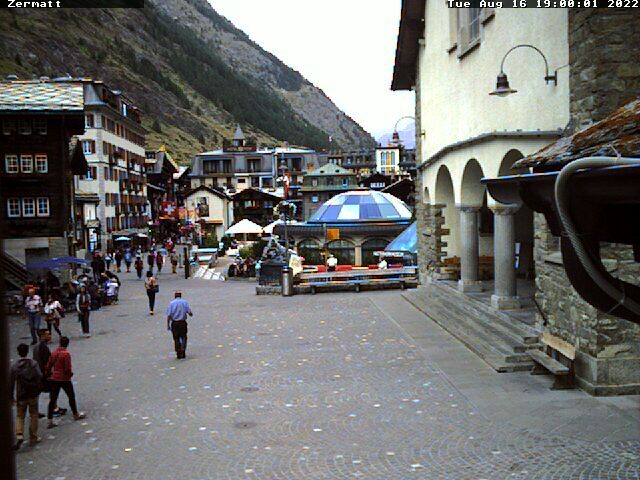 Zermatt, located at an altitude of 1,620 m, is the tourism centre of the Valais region. From here you have access to the huge ski-arena which reaches around the Matterhorn all the way to Italy. The exclusive spa resort pulsates with life: shopping facilities, events and leisure-time opportunities such as ice skating, curling and tobogganing care for great entertainment even off the slopes. Despite the tourism, Zermatt didn't lose anything of its original attraction. There are no architectural blunders like high-rise buildings, the Valais architecture maintains a traditional charm. Zermatt is car-free, so you get around by train, electric bus or, very romantic, by horse-drawn carriage. Numerous hiking tracks lead to secluded hamlets or to sunny observation terraces above Zermatt, Täsch and Randa. On the mountain ridge "Gornergrat" at Rifflberg you can take wonderful snow show hikes, and the Gornergrat lift takes you to the Gornergrat platform, from where you can enjoy the beautiful view over Monte Rosa and Matterhorn. Not on the mountain, but in the mountain there is a special experience waiting for young and old: the glacier palace. The huge ice cave is located in the ski area Matterhorn Glacier Paradise in the glacier and 15 m below the surface. A lift takes you down to the world of perpetual ice. A fairytale world in a blue shimmer with ice crystals and ice sculptures awaits to be explored in the "palace" of glacial ice. You can go through the glacial tunnel or down the ice slide, and in case you want to take a short break, there are ice benches with cosy fells waiting for you. The glacier palace surely is a highlight for the whole family. With the lift pass "Zermatt-Täsch" you can ski on over 200 km of fine pistes in the ski region Zermatt-Matterhorn, which also comprises 34 modern lift systems. It's all about superlatives in this marvellous area: at an altitude of approx. 4,000 m, the large Matterhorn glacier paradise is the highest ski area in the Alps. The highest lift at Klein Matterhorn takes you up to 3,883 m and thus to the highest mountain station in Europe. From up here you have a fantastic panorama over 38 Alpine giants and 14 glaciers. The glacier ski area Zermatt-Matterhon is one of the most popular ski resorts in Switzerland, not only because of its diversity and snow-certainty all year long. The longest slope as a total length of 25 km, and with blue, red and especially many black pistes every skier - regardless of their personal taste and level - can find their preferred piste. All in all you can look forward to seemingly endless kilometres of piste, all of them with a view of the characteristic Matterhorn summit. The lift pass "International" also gives you access to the Italian Cervinia, giving you an extension to altogether 360 km of pistes (see region). If you're looking for the ultimate round trip of all ski mountains in the region we recommend trying the Matterhorn Ski Safari. On two different routes (Safari Silver and Safari Gold) you can ski on fantastic slopes all day without taking the same lift twice. Starting at Rothorn you can ski vie Riffelberg, Theodul glacier, Trockener Steg, Matterhorn glacier paradise, Breuil-Cervinia, Testa Grigia and, after all, back to Zermatt via Stafelalp.As if that much choice of piste wasn't enough, the region offers further specials, such as e.g. the "slow slopes". All skiers are expected to ski slow and controlled on these specially signed pistes, making for a perfect area for careful skiers and wallowers who are not looking for the thrill of speed. Several snow parks and a total of 36 km secured off-piste tracks for experienced free riders round off the diverse offer at Matterhorn. Zermatt also has quite a bit to offer off-piste. After a great day on the piste, you can jump into the apres ski and nigh tlife. The rustic "Olympia Stüble" awaits you at the valley run Rothorn. The "Bahnhofstrasse" (railway station street) is the apres ski central point, as well as the best shopping mile ever. Lots of boutiques, bars with live music entice guests to swing by. Those looking for a quieter evening can visit one of over 90 restaurants, whether hearty, simple fare in "Schwyzer Stübli" or international cuisine in "The Pipe Surfers Cantina" (mix of African, Indian, Mexican and Thai dishes). Moreover, you can play tennis, go ice skating, ice climbing or paragliding. The surrounding area also offers many cultural highlights, so a visit to the Matterhorn Museum is worth your while. The cross-country selection in Zermatt's surrounding area is relatively laid-back. There is, however, a 15 km long stretch from Täsch to Randa through the idyllic winter landscape. The high-altitude run "Füri - Schweigmatten" is located at 1,864 m and offers gorgeous views of the surrounding mountain landscape.